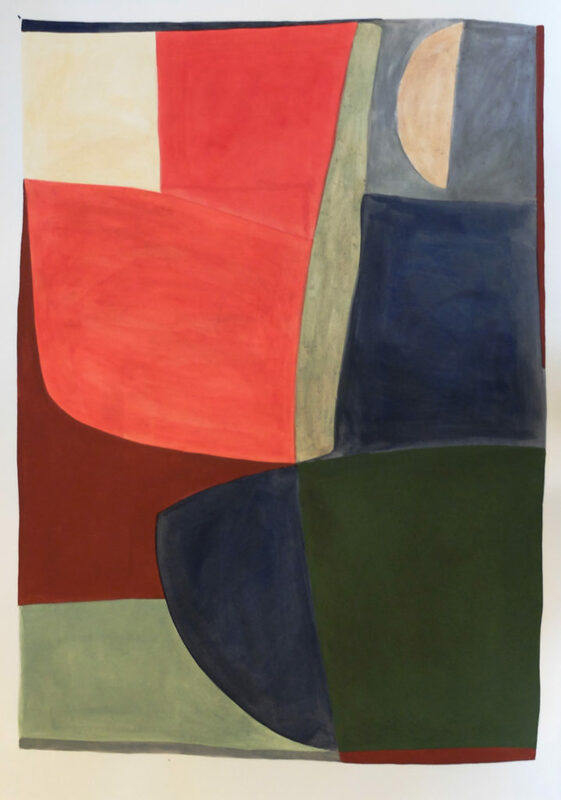 For London Design Week, OTOMYS art gallery (www.otomys.com) is delighted to present an exclusive collection of contemporary works on paper by British artist, Nina Dolan and French artist, Caroline Denervaud. Using techniques of mark making on fabriano paper, Dolan creates works which are precise and meticulous in their creation. Denervaud is inspired by dance and movement and her paintings exude a sense of freedom and fluidity with the use of bold, casein pigments. Complemented by beautiful organic, hand built stoneware by Parisienne, Linda Ouhbi. Mixed media on Fabriano paper ‘An Art of passage, about reality that has already passed by and which leaves a spread or spray of traces’ – Susan Sontag 1981. My drawings are more about evocation than literal representation. They are about the passing of time, captured thoughts about what is happening in the world. The notion of trace extends to the forms of my drawings, where lines billow and meander across the sheets, often recurring in the next drawing. By limiting myself to certain rules and codes in my mind, the lines build up to an overall rhythm, evoking emotions and I would almost say, sounds, as in music or noise. Casein paintings on Fabriano paper French artist, Caroline Denervaud has been exploring the ways in which movement can convey intrinsic emotions from a very young age. Dancing and allowing herself to accept natural bodily motion has been a prominent part of her life and has become the foundation of her expansive practice, which includes performance, video, paintings and collage. Through Denervaud’s performance, she creates marks – marks of movement, marks of time, marks of emotions. Feelings and sensations guide her to create a shape, through movement, on paper or in space. The French lighting brand creates a range of soft and sensual pendant lamps using hand printed, cotton fabrics over a bamboo spiral. Inspired by travel and a myriad of cultures, the designs reflect traditional patterns of Spanish & Portuguese Azulejos, cobalt blue of the Mediterranean and other beautiful landscapes around the world. Paris based, Linda Ouhbi creates pieces in stoneware using a hand building and coil technique. This ancestral process necessitates a slow construction and permits the development of a relationship with each piece. Throughout the quest for a fragile balance during the construction of each piece, there begins a dialogue that influences the shapes that emerge. Each piece therefore holds the traces of a unique emotional quality, an intimate premise that comes from within. Moved by the rare subtlety of prehistoric works and inspired by the creations of the first people, Linda Ouhbi creates pieces that question the ideas of function and utility, but above all the notion of time and progress.